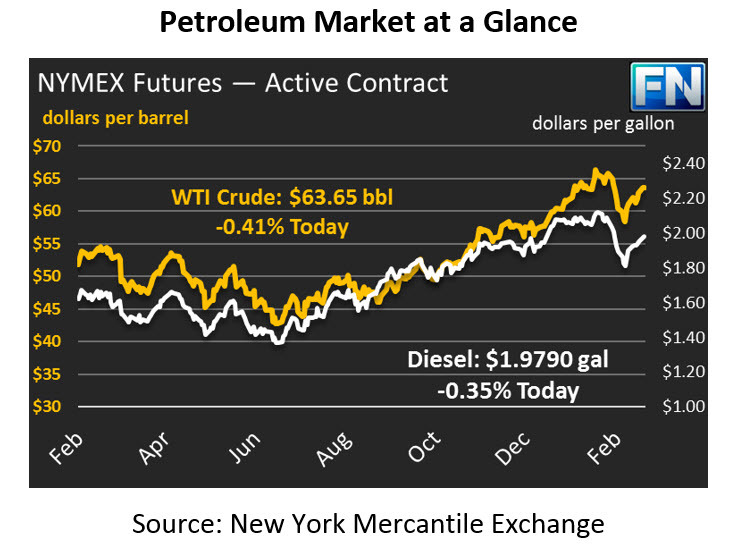 Home > Market News > Will Fed Reserve Dictate Oil Prices This Week? Will Fed Reserve Dictate Oil Prices This Week? Yesterday, prices continued the trend of starting the day with stagnant prices, only to jump higher during formal trading hours. WTI crude gained 36 cents yesterday, not a huge leap but enough to maintain the three-day winning streak. This morning, prices are once again trending lower, with crude oil at $63.65, a loss of 26 cents. We’ll see if markets are able to rally once again to continue the winning streak. Refined fuels outperformed crude slightly, enjoying moderate gains. Diesel prices picked up 1.7 cents (0.8%), while gasoline prices rose 1.8 cents (1.0%). Today, both products are trading lower in conjunction with crude. Diesel prices are currently $1.9790, a loss of 0.7 cents. Gasoline prices are down to $1.8201, also losing 0.7 cents since yesterday’s close. Crude gains have come in conjunction with the stock market’s four-day winning streak. Recently the two markets have been eerily linked, with both correcting in early February after long bullish runs. With bond yields still low and stock market analysts forecasting an end of the bull market, financial institutions flocked to oil markets, which showed more promise for high returns. CFTC data showed markets hitting record high net length, indicating that more oil futures contracts were being bought than normal. Both markets corrected lower in the face of higher interest rates, showing they’re being supported by financial institutions in addition to normal fundamental trends. In an ironic twist for a country that last year announced plans to ban internal combustion engine vehicles by 2040, The United Kingdom is on track to become a net oil exporter by the end of the year. Projects in the works in the North Sea will increase production enough that exports surpass imports for the first time in fourteen years. Still, UK is by no means a major producer – their expected production of 1 MMbpd of crude oil is small compared to the U.S.’s over 10 MMbpd of production. Jerome Powell, appointed by President Trump to head the Federal Reserve, will testify before Congress for the first time since his appoint. Markets are watching to see his beliefs about the economy and the dollar. He is expected to highlight strengths in the economy, though if any hint at higher inflation and corresponding interest rate hikes could boost the dollar and send oil prices lower.